myTaxi is an app that bypasses the traditional dispatch centers, allowing passengers to book their own rides. The German Association of Taxis and Hire Cars (BZP) estimates there are around 260 million taxi passengers per year in the country, with total turnover of around €2.6 billion ($3.4 billion) in taxi fares. 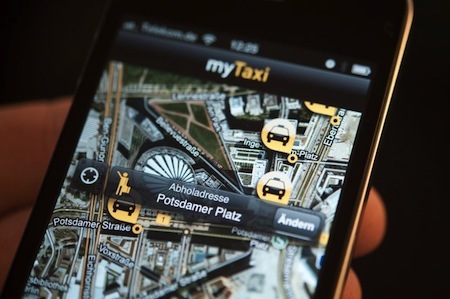 Currently, myTaxi operates in 30 German cities and the company claims that 800,000 smartphone users have downloaded the app. Taxi drivers also support the app in Austria and Switzerland. So far, however, only a small percentage of drivers have registered with the service. All we need to do is hook this app up to Google's self-driving cars, instructing them to come when we call. Presto! Now you've got Johnny Cab, from Total Recall.